No other artist epitomizes the whole atmosphere of elegance and hedonistic pleasure which pervaded Paris society at the first decade of the century as does Helleu. A close friend of Proust and the inspiration for one of the principal characters in La Recherche du Temps Perdu, Helleu’s whole life style echoed the incomparable elegance and flow of his drawing, the sheer style of his art, and his eye for the poses of the beautiful women who were his friends and his patrons. During the 1870’s, Helleu had come to know the painters of Impressionism and also artists Sargent and Whistler who became his special friends and inspiration. By the early I880’s, he had already developed the quality of expressive sweeping line, which is the essence of his drawing, but in 1885 he was encouraged by Tissot to try working on prints in drypoint. At this time, Tissot had decided, after the death of his lover and model Kathleen Newton, to travel to the Holy Land on an artistic pilgrimage. Having decided he would no longer engrave, he gave Helleu his diamond stylus…a literal and figurative “passing of the baton”. It was in the incision and texture of drypoint that his art was to reach one of its greatest peaks. He had an innate feel for the balance between a lightly curving stroke and the deeply cut highly tonal burr of the strongest drypoint. Around the turn of the century he started to combine drypoint with multi-inking in colors, the areas of color restricted to such touches as the bows on the hats, the hair color or the red of the lips. The plate was drawn at a single sitting, and then the color inks were brushed onto it. The results are some of the most splendid and decorative of all Belle Epoque prints. 1859- Born on December 17, 1859 in Vannes, Brittany, France. Apprenticed during student years with ceramist Theodore Deck. Helleu established himself as a gifted painter of women’s portraits, with his marvelous plate decorations. Worked with Deck off and on until 1890, to support himself, while continuing to draw and paint. Deck later became the head of Sevres. 1880’s-Became good friends with some of the leading artists of the day including Tissot, Whistler, Monet, and Rodin. Worked in pastels and oils and began working in prints. Began doing portrait commissions. 1884-Commissioned to do a portrait of 14-year-old Alice Guerin. Fell madly in love, and married her two years later. He adored her throughout their lives together and she and their children were the subjects of many of his drawings and prints. 1885- Traveled with Sargent to Holland. 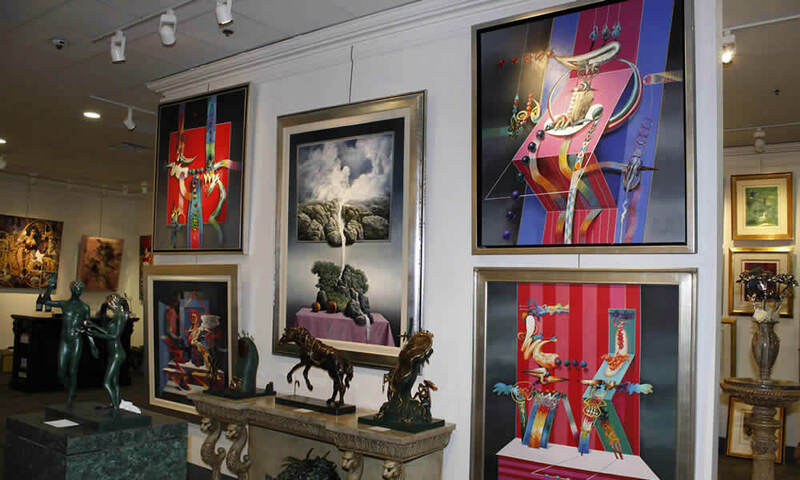 Travels to England, spending time with Gerome, Sargent and Tissot, among others. Working mostly in pastels. had decided, after the death of his lover and favorite model Kathleen Newton, to give up the secular world and was preparing to go to the Holy Land on an artistic pilgrimage. Having decided he would no longer engrave, he gave Helleu his diamond stylus…a literal and figurative “passing of the baton”. The moment Helleu set the diamond to a copper plate he realized that he had discovered his true medium. In his hand the diamond plowed a powerful furrow in the soft copper surface, the gouged-out burrs producing a velvet-smooth line that was sure and rich. He found that there was little he could not do with the medium: his hand was so sure he did not need to engrave from preliminary drawings, but could attack the plate directly from the live model. The medium also appealed to his sitters. The look of a drypoint is one that pencil or ink drawing can never duplicate, utterly rich and sure. And it had the added advantage that a sitter could have several proofs printed to give to relations or to friends. Helleu was able to maintain very high standards in the quality of his prints by producing such extraordinarily small editions. Most of his drypoints were of beautiful women. At home, in drawing rooms, art galleries, gardens or parks, he lightly indicated backgrounds suitable to the beautiful and elegant women he depicted. He became a master at transferring hair onto the copper plate: the most elaborate coiffures came alive on the plate, texture, shape, cut and color held no secrets from him. Many of his sitters are seen wearing hats, frequently with feathers, thus giving him the opportunity of contrasting the textures of skin, hair, fabric and feather. His friend and critic Goncourt called the drypoints “snapshots of the gracefullness of women” (‘les instantes de la grace de la femme’). This term “snapshots” thus became a term later ascribed to photography, but originated to describe the work of Helleu. Some of his drypoints are in color. He invariably used color discreetly, sometimes only for a feather, to heighten hair, delicate complexion or eyes or lips. Color was applied à la poupée, the different color inks applied to the appropriate portion of the plate using a tampon, or “dabber”, called a “poupée”. The plate was then wiped as normal, and printed. Since the printing of each proof required the individual inking of the plate, the result was frequent differences between each proof in color. In any case, as most of Helleu’s drypoints were printed in very small quantities, sometimes editions of between two and ten proofs, such differences in color as occurred made each individual proof unique. 1886-Helleu met Count Robert de Montesquiou-Fezensac, the poet and aesthete, who purchased a number of Helleu’s drypoints as the start of a large collection. He was later to write a book on Helleu which was published in 1913, and is still the only definitive catalogue of Helleu. Montesquiou introduced Helleu into the Salons of the old aristocracy as well as into the literary ones, He was very well-liked. Helleu never had trouble finding sitters among the aristocracy of Paris. In his circle of literary friends he became great friends of Marcel Proust, who based a character in one of his famous novels, Remembrance of Things Past, on Helleu. 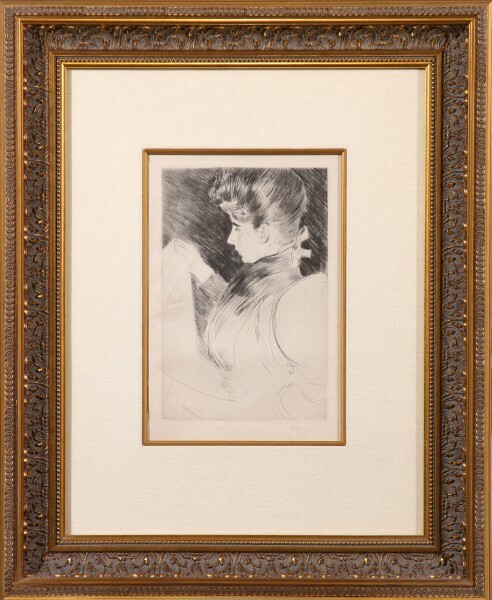 1985- Helleu exhibited in London where he was introduced to the Prince and Princess of Wales, who bought several of his drypoints, and commissioned him to execute a portrait of the Princess, later Queen Alexandra of Russia. 1900-Helleu met the Duchess of Marlborough, the former Consuelo Vanderbilt. She sat for him in London, Blenheim Palace, and in Paris. She was a favorite model and he executed a series of drypoint portraits of her, as well as many pastels and drawings. 1902-Helleu made his first trip to the United States, where he executed many portrait commissions. Donated 50 drypoints to Bibliotheque Nationale. 1904-Helleu was made a Chevalier of the Legion of Honor. 1912-Helleu made his second trip to the United States. This led to 37 new portrait commissions. Because of his relationship with Consuelo Vanderbilt, one of his biggest collectors was W. K. Vanderbilt. He was also commissioned to paint the ceiling of Grand Central Station, in New York City. He designed it as a night sky, the dark blue surrounded by the signs of the Zodiac in gold with a silver milky way, while stars and planets, internally lit, glowed. Literally tens of millions of people have marveled at the ceiling mural, a true masterpiece, which has recently been cleaned and restored to it’s original glory. 1913-Publication of Montesquiou’s book, now long out of print. At this time Helleu had already done over 2000 drypoints. Fewer than 100 images are reproduced in the book anyway. 1920-His third and last visit to the United States, where he had a major exhibition at the Wildenstein Gallery. The elegance of the Belle Epoque had been replaced by the Roaring Twenties and women no longer wished to be portrayed in his elegant, romantic style. His last trip to the U.S. convinced him that he was no longer in touch with the post World War I esthetic, and he went into retirement upon returning to France. Shortly after his return to France from New York, he destroyed nearly all of his copper plates. Because of the incredible beauty and desirability of Helleu’s works, one rarely sees more than one or two pieces available for sale. Part of this of course is because of the very small editions, and also because of the reluctance of collectors to part with them.